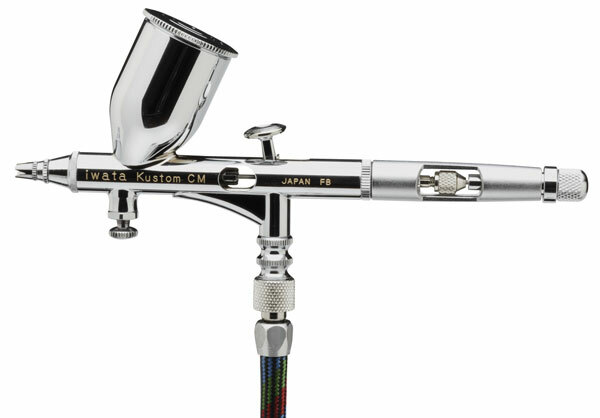 With their tall, spray-gun trigger design, Kustom airbrushes from Iwata offer the airbrush artist commanding control of trigger action and paint flow. All feature pre-set handles and PTFE needle packings. The MAC Daddy of all airbrushes! The Kustom Micron CM is framed around the Iwata Custom Micron airbrush. It provides extreme control of ultra fine-line spray, silky-smooth atomization, and ultimate paint-flow control with hand-tuned, hand-adjusted performance. This airbrush is world renowned as the professional’s choice for the utmost in fine line detail, and features a 0.23 mm "Matched Head System" nozzle, MAC (Micro Air Control) valve for precise air pressure control, and large ½ oz (15 ml) gravity-feed fluid cup.